Air Castle is a nine patch quilt block containing half square triangles, three-quarter square triangles, and a square in the square unit for the centre of the quilt block. 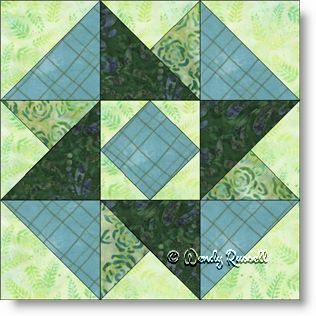 This is an easy to intermediate skill level quilt block pattern. The sample quilt shows the blocks laid out side by side with several borders. A totally different look can be achieved by simply switching out the colours in the borders.